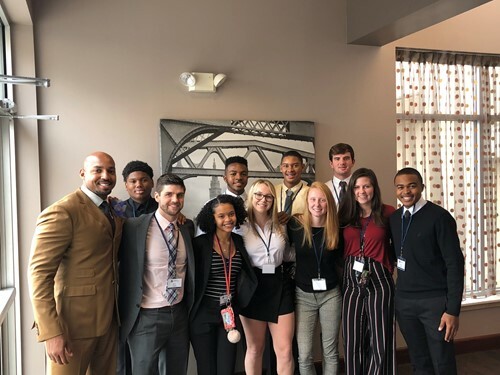 Nine students from Charles F. Brush High School’s Arc Elite Leadership organization were recently invited to Downtown Cleveland for the 2018 Center for Community Solutions Celebration of Human Service at the Hilton Garden Inn. The group was specifically invited to listen to a presentation delivered by Brush Alumni and Arc Elite Leader, Roy Hall, who addressed the group as the event’s keynote speaker. Roy’s speech fired up the hundreds of human service professionals and those receiving awards for their efforts towards improving the communities in and around the Greater Cleveland area. The students were then given the opportunity to participate in group discussions and learn about career opportunities in human service industries. The Arc Elite Leadership organization is dedicated to providing students in the South Euclid Lyndhurst Schools with experiences and opportunities that will help them to grow and become future-ready. Thank you to everyone involved in making this event a success.